The ANU College of Physical and Mathematical Sciences is organizing the international conference Baxter 2015: Exactly Solved Models & Beyond in honour of Rodney Baxter's 75th birthday. The conference will highlight Professor Baxter's pioneering contributions in exactly solved models in statistical mechanics which have inspired crucial developments in key areas of theoretical physics and mathematics. 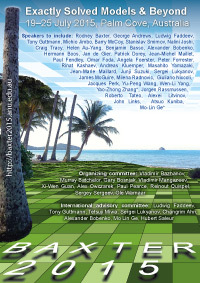 The conference will be held on 19–25 July 2015 in Palm Cove, Australia, located near the city of Cairns in the State of Queensland.